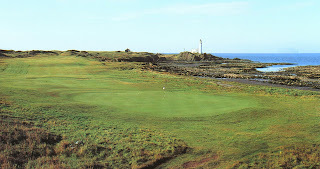 Golf’s oldest major, the British Open, begins today at Turnberry, Scotland. Turnberry is one of the golf courses featured in a new atlas available from Ball State University Libraries. World Atlas of Golf: The Greatest Courses and How They Are Played is available from the Atlas Collection in Bracken Library. “This book features the greatest golf courses in the world that display architectural brilliance or are simply important in the history of the game.” World Atlas of Golf was published in Great Britain in 2008. The atlas includes a section on architectural design theory, the business of course design, and routing the golf course. 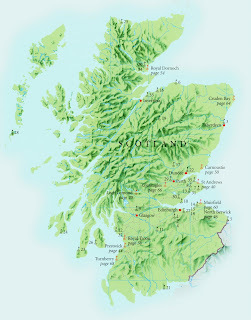 Maps and photographs of golf courses from around the world are featured, organized by continent. (Turnberry is featured above). The location of courses on each continent or region is featured at the beginning of the chapters. A description of each course is provided, including how to play the course, memorable holes, and the history of the course. North America and Europe comprises the majority of the courses covered, including Bethpage Black, Augusta National, Pebble Beach, St Andrews, Prestwick, and Royal St. George’s. Last year students in Ball State University’s College of Architecture and Planning designed miniature golf holes as part of a landscape architecture assignment. Opportunities in the business of golf course design are available to graduates of landscape architecture. This new atlas will be an excellent resource for students, researchers, and golfers as well. Many of the tourist maps in the GIS Research and Map Collection also offer information and guides about golf courses in the area, including popular resort locations like Hilton Head, Myrtle Beach, and Monterey. Golfs de France is a map of golf courses located in France. USA Today Golf Atlas is also available from the Atlas Collection. World Atlas of Golf is available from the Atlas Collection and may be circulated for 28 days or longer. For more information about this atlas or other cartographic resources, please contact the GIS Research and Map Collection at 765/285-1097.